So you have finally secured the property of your dreams, with a lush green lawn that carpets lovely rolling hills. The problem is, now you have to figure out how to mow that lawn. Mowing steep hills can be tricky, not just because of the effort it takes to get up them, but also because tipping can be an issue. We can help you solve that problem. Stick with us for all the info you need on the best self propelled lawn mower for hills. Depending on the size of the property, you may want to consider a riding lawn mower, but for most yards, a self-propelled push mower is the answer. Though you do need to walk along behind it, it has independent power to propel it up those hills, and tipping is less of a worry than with a riding mower. If you are riding a mower when it tips, you’ll go down with it. In this article, we’ll break down all the considerations around purchasing the right tool for the job and then show you 5 of the best self propelled lawn mowers for hills. Before you now it, you’ll be maintaining your beautiful property with ease and spending more time simply enjoying it. What Makes a Great Mower for Hills? There are a number of features that can make a mower work better than the average model on hilly terrain. The best hillside mowers have traction control combined with independent power to propel them. Just walking your own body up a hill can take some energy, but walking up and down it many times over while pushing a lawn mower can be exhausting. That’s why you’ll want to find a self-propelled mower. 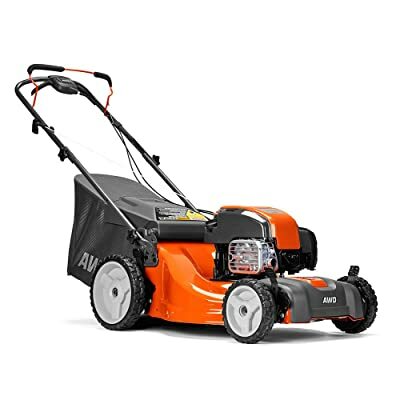 When the mower is engaged – typically this means holding a special bar back against the handle as you mow – these models basically propel themselves and you just need to hold on and steer. These mowers use a drive wheel to power the wheels when the mower is engaged. They can’t “get away from you” because releasing the trigger bar that engages this feature powers off both the drive wheel and cutting blade, though the engine may remain running. However, you should look for a mower with variable speed so you don’t feel that you have to move uncomfortably fast. Just like in a vehicle, a drive wheel can either power the front wheels (FWD) or the rear wheels (RWD). Some higher-end machines have two drive wheels to power both the front and rear wheels – this called all-wheel drive or AWD. Though front-wheel drive mowers tend to turn and maneuver a bit more easily on flat terrain, rear-wheel models are actually better for mowing steep hills. They steer better and are just easier to handle on ground where there is less traction. If you can swing it, an AWD model offers the best of both worlds. It’s nice to have the flexibility to decide whether you’d like to have the grass clippings automatically bagged or else mulched and spread over the lawn. There are pluses and minuses to each, so if you have the ability to do both, you can switch up your strategy depending on the day and even the particular location within your yard. Mulching is great because it shreds those clippings into a fine material that, when left on the lawn, both fertilizes the grass and helps the lawn retain moisture. Since we are talking about hilly land, it’s nice to be able to both mow and fertilize at the same time. Bagging, on the other hand, allows you to collect and dump the grass cuttings at a different location of your choosing. You may prefer to bag clippings if the look of the lawn needs to be clean and precise. It’s also good to bag clippings that contain a lot of cut weeds, to avoid spreading quite so many seeds that will give root to new weeds. For this, it is really a matter of personal choice. Gas powered mowers are the most common, because they tend to have a longer runtime per tank than a battery model does per charge. Gas mowers also work just as powerfully on an almost-empty tank of gas as they do on a full tank. However, gas mowers are very loud and pump out a fair amount of exhaust. Battery-powered mowers, on the other hand, are more environmentally friendly. They don’t have any emissions to speak of, and run much more quietly than gas-powered versions. But on the minus side, battery life rarely exceeds an hour before you’ll need to recharge, and the power tends to diminish as the battery drains. In terms of weight, gas mowers are heavier and require a careful mix of oil and ethanol-free gas. Battery-powered mowers don’t need any extra ongoing supplies, but it can be nice to have a secondary battery available for times when you run out of juice in the middle of the job. Foldable handle – if space is at a premium, it can be helpful to have a mower that can fold up to conserve storage space. Now let’s dig deeper into the features and find the best self-propelled lawn mower for hills that fits your needs. This Snapper lawn mower is a solid and dependable work horse that’s fitted out with a lot of nice extras. 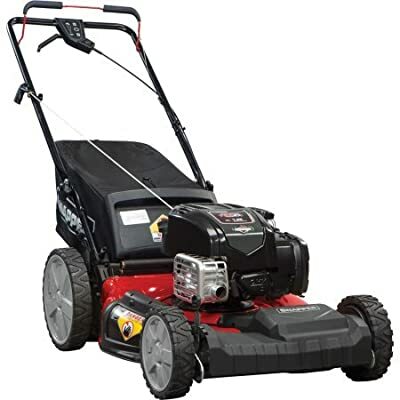 It features a high-performance Briggs & Stratton 163cc OHV 725EXi series engine with a no-prime, no-choke system. That makes starting it up a breeze – just pull and go. You also need never change the oil! Just check the level and add as needed. As is typical with rotary mowers like this, you can adjust the cutting height to six different positions. You can mulch, bag, or discharge the cuttings from the side of the mower. Though this lawn mower is a front wheel drive model, it has 8” front wheels paired with 11” rear wheels for better maneuverability on hills. In terms of ergonomics, this impressive machine even has a variable speed feature, so that you won’t ever be pulled along too quickly. The adjustable handle can accommodate people of varying heights, so no one should have to bend over to mow. When you’re done, there is an included wash-out port to make quick work of clean up. 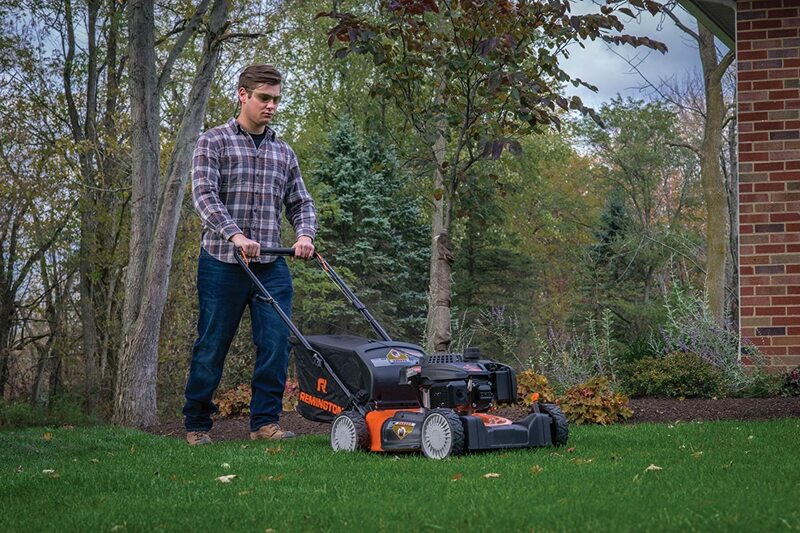 This mower is best for yards up to 1 acre of hilly, uneven, or flat terrain. It comes with a nice 3 year warranty. This Husqvarna mower also features a Briggs & Stratton 163cc engine. It comes with a 2-pull starting promise so you can get to work quickly. It will also never require an oil change, only that you refill the container as necessary. Overall, it is a sturdy unit that can tackle hills and other tough terrain with ease. The power is strong enough to pull itself up hills with only gentle guidance from you. The 21” is fairly standard, but the premier cut blades deliver professionally manicured results. Make short work of mowing those hills with the all-wheel drive propulsion and 11” high rear ball-bearing wheels. This mower is highly maneuverable and relatively light at 80 pounds. Lefties will especially appreciate the Dual Trigger Drive activation, which allows you to control the speed with either hand. However, the handle lacks padding and might not be comfortable for extended use; the handle also cannot be adjusted to different heights. It does feature a handy wash-out port, though. This is a mulching mower that also has a rear mounted collection bag. The deck is built out of sturdy 15-gauge steel. The Husqvarna LC221AH comes with a three year bumper-to-bumper warranty. 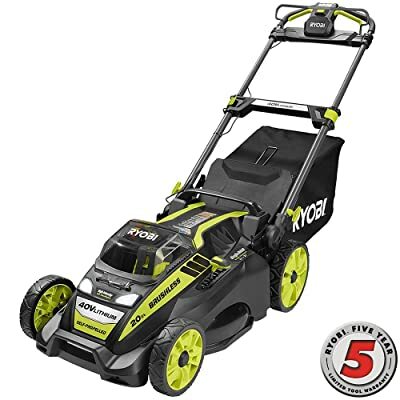 If you would like to avoid the hassle of gas engines, not to mention the noise and environmental impact, consider this Ryobi battery-powered model. It is powered by a 40-volt lithium ion battery, yet still offers gas-like power by virtue of its intelligent motor with load-sensing technology. The motor detects the power necessary in different terrains to maintain an optimal cutting speed. That keeps the mower from bogging down in overgrown grass yet saves power on easier terrain. 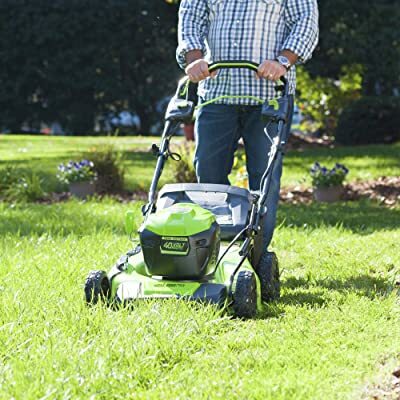 With a 20” cutting swath, push button start, and 7 height settings, this mower is easy to use. Its telescoping handle will allow anyone in the family to use this machine comfortably. The handle is also padded for comfort and folds up for easy storage when you’re done mowing. One of the best things about a battery-powered mower is its quiet operation. You can comfortably mow in the early morning or late evening without aggravating your neighbors or damaging your ears. There are even headlights to navigate in dim conditions. You may either mulch the clippings or bag them. If you have other Ryobi tools, you’ll be happy to learn that both the included battery and its charger are compatible with any Ryobi 40-volt products. This company offers a stellar 5 year warranty. The Remington RM310 offers a powerful 159cc OHV autochoke engine and rear wheel drive for superior performance on hills. The SureCut blade is designed to lift and circulate as it cuts, spreading mulch evenly rather than dropping it in clumps across your lawn. Clippings may be expelled from the side or bottom, depending on your preference. There is an optional collection bag as well, and the SureCut blade also helps keep cutting loose enough to easily dump if you choose to use the bag. The 21” deck is built of sturdy steel and is rust-resistant. There are 6 possible height settings to help you achieve the perfect cut. The variable speed option keeps you moving at a safe pace, especially on those hills. All four wheels are 8” and made of durable material. There are other ergonomic design features, as well. The handle is adjustable so that people of any height can mow without having to stoop over. The grips are comfort padded to minimize vibration to your hands and wrists. Users rave that this mower is a snap to put together out of the box, and that it starts reliably with just one or two pulls. A two year warranty is in place to ensure your satisfaction. If you’re looking for the power of a gas mower without the exhaust and noise, check out this Greenworks model. It runs nearly silently on a 40V battery and features a push button start. This mower has rear wheel drive for greater control on hills and a durable steel deck with a 21” cutting swath. Like other mowers on our list, the Greenworks allows you to mulch, rear bag, or side discharge the cuttings. Unlike other mowers, this one actually features a USB port in the battery that allows you to charge your electronic devices while you mow! We’re not sure anyone really needs to do that, but it’s nice to know you could in a pinch. Another cool feature is that there is a secondary port for storing the extra battery while you’re mowing. If you need to change batteries mid-job, the replacement is super handy. The battery life is reported as about 70 minutes in ideal conditions, but users report somewhere around 45 minutes of heavy duty work per charge. Greenworks has a whole range of 40V tools, and the battery for this mower can be used in any of them (and vice versa). The company offers a 4 year warranty on the mower itself, but only 2 years on the batteries. To ensure the longest possible life for your mower, it is important to do routine maintenance on it and schedule it for yearly tune-ups at the shop. We have collected a list of the things you can do at home to keep your self-propelled mower in top shape. It sounds like a little thing, but you’d be surprised how many folks simply toss out their owner’s manual. We always recommend taking the time to read through it, though, because it provides important information about how to use, store, and maintain your mower. The manual may also contain details on uses that will void your warranty, and that’s the last thing you want to do. Self propelled lawn mowers power through a lot of loose debris, including grass and weed cuttings, dust, gravel, twigs, and possibly even animal waste. You don’t necessarily need to give it a full bath after each mow, but semi-regular cleaning is crucial to keeping your mower in good working order. After awhile, all that gunk builds up and may interfere with the moving parts. Some mowers have a convenient washout port that allows you to attach a garden hose for flushing out debris from under the deck. If yours doesn’t, carefully tip your mower over onto its side and rinse it out that way. Never use your fingers to pry out trapped twigs or gravel – a wooden stick of some sort is a much safer option. Your mower’s engine needs an unobstructed flow of clean air to work properly. Just like with your furnace at home, providing that means changing the air filter periodically. There is no hard and fast rule for timing, because it depends a lot on your particular lawn. Just check the filter every month or so and replace it when it has become coated with grime. Remember to wipe clean the area around the filter after pulling out the old, clogged one and before replacing a fresh one. All gas engines need a spark to burn fuel. We recommend replacing your mower’s spark plug once per season, even if the old one still technically works. This is because a new spark plug allows for an easier start-up of the engine and better fuel economy. Saving both time and money (in fuel) makes this strategy a cost-effective one. Again, like a car, your mower’s engine needs clean oil in order to avoid seizing. This is a process that can be done easily by you, but there are a few tricks to it. First, before you begin, make sure that the engine is warm but not hot. This helps the oil loosen up enough to drain fully and pull any impurities out with it. When releasing the oil, collect it in a plastic container with a lid. Oil may be drained through a drain hole, by tipping the mower over to empty it through the dipstick, or via an oil extraction tool. Old oil must be disposed of at a service station or recycling center that accepts oil, never in the trash. Make sure that the drain hole is securely closed before filling the oil reservoir again. Be careful not to overfill, and to use the type of oil specified in your mower’s user manual. For a clean cut, you need sharp blades. When you use a dull blade, it rips the grass blades and leaves jagged tears that can weaken the grass and leave it susceptible to disease. Chewed up grass also doesn’t look as nice as crisply cut grass does. It’s a good idea to sharpen your blades around 2 x per season. You may want to take the mower to a professional the first time and ask if you can watch. Then you should be able to tackle the job on your own. By now you should have a pretty good idea of the best self propelled lawn mower for hills to suit your space. It’s never totally easy to mow hills, but with a self propelled mower it is much more doable. The right tool for the job makes all the difference. And in the end, your yard is going to look fantastic. Have a great summer; enjoy that beautiful lawn of yours!